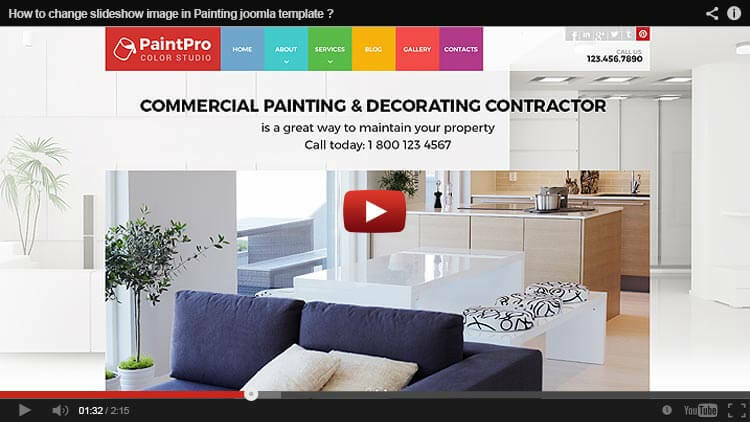 This paint pro template is for all customers seeking a website template that deals with a painting, interior design or any related business. So if you run a paint company, an interior design business this is the website that you need to have. Our template is a Joomla template, Joomla as a website design tool has a lot of advantages that you will experience when you run your business. So what special features does Joomla have? In general, Joomla is a really easy language or design tool to learn, you do not need special programming experience to be able to do any customization of the website. Additionally, Joomla has hundreds of thousands of plugins availed on the web, so if you want to add cool features on your website, you can easily do this by adding a Joomla plugin for it. Since it is one of the most famous design tools, you will also benefit from dozens of available tutorials whether on youtube.com or any other video tutorial, so customizing your template should never be a problem. You can also check out our YouTube channel where there is already a lot of video tutorials about Joomla and the multiple things that you might need: https://www.youtube.com/results?search_query=gridgum+joomla. Joomla has also a comprehensive navigation system, you can easily manage different sites with hundreds or more of subpages, its management system is really easy to learn and with just one click you can add many sub-directories to your website. We are also pleased to announce that all HD pictures that you see in the preview are in-cooperated with our website template. We also offer one month of the free host, so we offer you with a head start by having a low-cost website and we also provide this website with the maximum great features that will boost the speed of your website development. we will create youtube guids for you specially which can be seen here. HOW TO CHANGE SLIDESHOW IMAGE ? Dear customer, Please go to the page where you have bought this template and see what version template is, it is 3.4.3 version. when you install the template on any normal hosting then Joomla offer you to upload it to lates 3.8 version, click on this button and you will have latest 3.8 version of this template. If you host provider do not give you PHP version change function, we recommend you to find normal host provider like godaddy.com, m9host.com, hotgator.com and so on .... but not yours. as you can check demo preview, it is latest 3.8 version because we have upgraded it by one click.